How long will your trip be? Where will you go? How much gear do you need to carry? Thinking about these questions will help you decide what size of pack is best suited to your needs. For minimalist carry setups and short excursions up to around 20L of pack volume should get the job done. If you need to pack a little extra for longer day trips, consider packs around the 20L to 35L range. Look upwards of this range if you’re planning overnight or hut tours (around 35L to 55L) or multi-day trips with equipment such as a tent and cooking gear (around 60L to 70L). If your pack doesn’t fit well it won’t be comfortable for long hours on the slopes. Plus it could potentially reduce your stability and freedom of movement – not a situation you want to be in when trying to stay safe on the snow. Remember, the fit will change once you start filling the bag. So if you can, try the pack on in person and load it up with snow gear before you buy it. Also make sure it suits your torso length (some packs offer adjustable torso lengths). In addition, some packs come in gender-specific options which will suit male and female users respectively. In an emergency time is precious. You don’t want to waste it trying to get to hard-to-reach safety gear. Your pack should provide designated storage for snow tools such as a probe and shovel, ideally within their own compartment and easily accessible without having to remove the skis or board. Make sure the gear is stored internally rather than attached externally to the pack (which helps reduce the chances of it being ripped off or lost from snagging, accidents or avalanches). Look for organization pockets too; they’ll help you access safety gear faster and more easily. Rummaging for gear is both frustrating and a waste of time, so try to ensure your pack offers convenient access to the contents. Back panel access to the main compartment is handy for reaching gear throughout the compartment, plus it helps to keep snow off the back panel when laying the pack down to get to gear. Ideally look for at least two access options (such as top and back, back and side, etc.) to maximize efficient access to gear throughout the pack. Your pack should cater to your specific needs, which might change depending on different trips. However, there are a few key features that are handy to have for a range of trips. For instance, exterior loops to carry an ice axe, a helmet carry system to keep the helmet secure when not in use, and quick-access storage for goggles. Plus you may find it useful having additional attachment points for extra gear as required. Think about what carry requirements you really need your pack to handle, and choose accordingly. Skiing and snowboarding can be tough on your carry gear, so a solid build is key. It doesn’t need to be built like a fortress (remember, the more durable a bag is, the heavier it likely is). But you never know when the bag may scrape past tree branches or unforgiving rock faces. Plus your gear can be hard on your pack too. So it should at least offer abrasion-resistant fabric in areas of high wear, such as the bottom of the pack or where the sharp edges of snow safety gear, skis or a snowboard may connect with the fabric. Also think about reinforced seams and stitching in high-stress areas if you’re going to be making big demands of your gear and/or hauling heavy loads. You’re going to be in wet and snowy conditions. So it makes sense your gear should have at least some degree of water resistance. Consider features such as water-resistant coatings, a back panel designed to shed snow, water-resistant zippers, sealed seams, and storm flaps over zippers. The degree of weatherproofness you need will be trip, gear and environment-specific. In general (but not always) expect to pay a little extra the more weatherproof a pack is. However, if you’re on a budget you can pick up some inexpensive dry bags (or even trash bags) to provide extra protection for important items such as clothing and electronics that you don’t want to get wet. Different packs will carry skis and boards in different ways. For instance, some may offer vertical or horizontal board carry, diagonal or A-frame ski carry, or a mixture of options. Ideally look for a pack that gives you more options rather than less, as this will give you greater carry flexibility in a range of environments. For example A-frame carry can keep the load more stable but will be a hindrance in areas with low-hanging branches or rocks. If you can, try to get the attachment strap measurements before buying the pack so you can check they’ll accommodate your skis or board. Having a pack with hydration bladder compatibility means easy access to water without having to slow down or remove the pack. Ideally the bag should offer insulated routing along the shoulder strap for the hose, with designated storage for the bladder and an exit port for the tube. A good suspension system will help keep you comfortable on the go, enhance load stability, and assist with carrying heavier loads. Look for elements such as a comfortable and adjustable sternum strap and waist belt, a suitably rigid frame to suit the load, and comfortable padding in the straps and waist belt. Compression straps also help bring the load closer to your body for better stability and comfort. It’s important to note that backpacks with airbags won’t guarantee you will survive an avalanche or won’t get injured. However, they can greatly reduce the chances of injuries (particularly to the head and neck), as well as offering the added bonus of keeping you as close to the snow’s surface as possible. This will make the rescue process easier and faster, thereby boosting your survival chances. There is of course no requirement to get a pack with an avalanche airbag, and they will be heavier and more expensive than snow packs without an airbag system. However, it’s worth considering getting such a pack in areas that are prone to avalanches (plus it can boost your peace of mind). Remember it’s important to be aware of and implement appropriate snow safety knowledge at all times, and to know how to use avalanche safety gear appropriately. A variety of avalanche and snow safety courses are available to help keep you and your trip companions safe and prepared on the slopes. An AvaLung is a piece of equipment you may want to consider adding to your carry setup. Created by Black Diamond and available in different versions, it helps you breathe when trapped under the snow in an avalanche. It works by taking oxygen from the snowpack while exhaling carbon dioxide away from your face, which maximizes the period of time before asphyxiation. Like airbags, an AvaLung isn’t guaranteed to save your life, but it could buy you precious time while waiting for others to dig you out. The Dakine Heli 12L backpack is designed for carrying the essentials, and features exterior storage for a shovel along with vertical board carry and diagonal ski carry options. The interior includes a fleece-lined goggle pocket and a hydration bladder sleeve that can also double as a laptop sleeve. Looking for a bag that can move between the mountains and EDC? Burton’s Dayhiker Pro does a fine job. The 28L capacity suits a range of everyday or outdoor needs, with handy organization such as vertical board carry straps, laptop and tablet storage, a fleece-lined goggle or accessories pocket, two stretch water bottle pockets and a stretch front pocket. Even better, you get it all for a very reasonable price. The Heli Pro 24L backpack (also available in a women’s version) offers a choice of vertical snowboard carry and diagonal and A-frame ski carry. A snow tool pocket, fleece-lined goggle pocket, and side pocket keep essentials within easy reach, while back panel access provides handy access to the main compartment. The pack also offers front helmet attachment loops. Designed with a women-specific fit, this 20L pack is lightweight, slim and functional for carrying the essentials on the slopes. The pack provides vertical and horizontal board carry options, interior storage for snow tools, exterior pole loops, and a fleece-lined pocket for goggles or other accessories. The pack is also compatible with a hydration bladder and comes with a lifetime warranty. The Burton [ak] Incline 20L Backpack offers versatile carry options, durable construction and flexibility in a streamlined design. 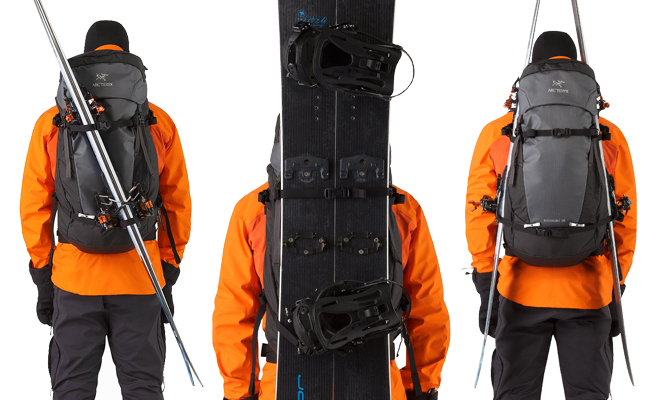 The pack provides A-frame splitboard carry and vertical snowboard/splitboard carry options. A range of pockets and exterior attachment options keep your gear tidy and accessible on the go, all backed by a lifetime warranty so you can hit the slopes with added peace of mind. And if you want to take to the trails in warmer weather, no problem. This versatile design can adjust to summer day hikes too. The updated Thule Upslope 20L offers great access thanks to a zipper that coils round the entire pack, letting you get to gear in the main compartment without having to take the pack off. The pack carries skis diagonally and a snowboard vertically, with stowable straps to prevent snagging. An insulated hydration sleeve helps prevent the hose freezing, and interior compression keeps your gear secure and stable on the move. Plus with side pockets that wrap round your body, this pack will carry comfortably and stably when you’re on the move. The Deuter Freerider Pro 30 includes a host of handy features to help you on the slopes, from a helmet holder and easy-access goggles pocket, to hydration bladder compatibility and a removable sitting mat. The front storage compartment keeps snow tools tidy and accessible, and the main compartment can be accessed via the top or back panel. The detachable hipbelt lets you tweak for added comfort or reduced weight, and is flexible enough to not hinder movement. The 30L pack offers vertical, diagonal and A-frame ski carry, along with vertical board carry. Plus with a choice of exterior attachment points you can add additional gear as required. In addition, the pack is also available in a women-specific 28L SL model. Osprey’s Kamber 32 and Kresta 30, designed for men and women respectively, combine functional features with comfortable design for a day in the backcountry. Both packs offer diagonal and side ski carry as well as vertical and horizontal board carry. Designated storage for snow tools and a quick-access goggles pocket help keep your gear tidy, and the main compartment is easily accessed through the back panel. The packs are also compatible with hydration bladders and include insulated hose routing on the shoulder strap. In addition, handy hipbelt pockets keep small essentials and snacks within easy reach. The Salomon QST 30 delivers a range of features in a sleek and lightweight design. These include a quick-access goggles pocket, stowable straps for poles or an ice axe, a hydration bladder compartment, snowboard carry, diagonal and side ski carry, and front pocket storage for snow tools. The 30L pack also includes large zipper pulls for easy access with gloves, as well as a wide-opening main compartment. Like the features of the Osprey Kamber 32 but want more space? The Osprey Kamber 42 delivers, sharing the same ski and board carry options, a front pocket for snow tools, hydration bladder compatibility, helmet carry and a pocket for goggles. However, the pack also includes a removable lid so you have the option for additional storage if needed or a means to shed excess weight and travel lighter. In addition, dual access through the top or back panel makes getting to your gear convenient and quick. The pack comes in a S/M size (40L) and M/L (42L) to suit different loads and users. Currently in pre-production stage, this 35L pack offers a sleek silhouette and a helmet holder, along with a wide-opening main compartment for easy access to gear. The pack also comes with a removable waterproof sleeve to protect tech devices. Tough and functional, the Arc’teryx Khamski 31 offers a choice of top and side access to gear in the main compartment. The 31L pack handles diagonal and A-frame ski carry as well as vertical board carry, and includes a front storage pocket for snow tools. Hydration bladder compatibility helps you stay easily hydrated on the go, while the removable lid provides additional storage space when needed and can help reduce the load when not required. Mystery Ranch bring their great load-bearing design capabilities to snow carry with the PATROL 35 backpack. The pack is designed to comfortably carry loads over 50 lbs. and includes an internal frame with a telescoping yoke to suit different torso lengths. The 35L pack offers diagonal and A-frame ski carry and vertical board carry, with a front pocket for snow tools and a stick-it pocket that can hold a helmet. The bag’s lid offers pockets for storing quick-access items such as goggles or snacks, and can be removed to shed weight if desired. A choice of top and back panel entry allows flexible access to your gear. The PATROL 35 is available in Fall 2017 and comes in both men’s and women’s specific sizes. Thule delivers sleek functionality and flexibility with the Upslope 35L backpack. Back panel access lets you get to gear throughout the bag while keeping snow off the back panel. There’s also a dedicated front compartment for storing snow safety gear away from dry items. Additionally, the backpack can be used with the Mammut Removable Airbag 3.0 system (sold separately) for enhanced safety on the slopes. You never know when an avalanche may strike. But the Backcountry Access Float 22 Avalanche Airbag is great for that extra peace of mind when you’re on the slopes. The functional and safety-centered design incorporates a deployable 150-liter airbag that helps protect your head and neck in the event of an avalanche and also reduces snow burial depth. The pack is comfortable to wear and offers good freedom of movement. In addition, there’s dedicated storage for snow tools, as well as helmet carry, diagonal ski carry, and quick-access waist belt pockets. The Mammut Rocker R.A.S. 18L is a good option if you’re carrying just the essentials but still want avalanche protection. The bag includes Mammut’s Removable Airbag System (a refillable air canister is required, sold separately) and a stowable deployment handle. The pack can carry skis diagonally, offers a padded goggle pouch, and is hydration bladder compatible. Mammut’s Pro Protection Airbag 3.0 combines a solid, water-resistant build with avalanche safety and convenient organization. The pack’s airbag deploys around the head, neck and chest area to help protect against injuries, with a safety leg loop for added security. As a bonus the airbag system can be removed to utilize the pack for other functions, and can also be used in other compatible bags. The bag has an adjustable back length for a customized fit and features board carry and diagonal ski carry. The main compartment is conveniently accessed through the back panel and a front pocket keeps snow tools in order. A pocket and gear loop on the hip belt provide further organization, and if the hipbelt isn’t required it can be removed to shed weight. Avalanche airbags that rely on canisters only give one deployment per canister. But the Arc’teryx Voltair 20 and Voltair 30 offer the safety and convenience of an airbag that can be deployed multiple times in one day. The airbag system uses a rechargeable battery-powered fan to inflate the airbag, and will pause for a few seconds before continuing to pulse air for a minute to keep the bag inflated even with minor punctures. The packs include a leg loop to help you stay attached to the bag in the event of an avalanche. The Voltair 20 stores snow tools within the main compartment, while the Voltair 30 offers a designated secondary snow tool compartment. Both packs offer weatherproof construction, and carry skis or a board diagonally.